On the first day of March 1971, James Taylor appeared on the cover of Time magazine. Back before society fell into the throes of obsessing over celebrities, that was a very big deal. Taylor was heralded as "the face of new rock." 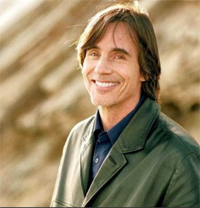 He became the quintessential singer-songwriter, the prototype for the modern-day troubadour, and the poster boy for the doleful din of California rock. While Taylor earned all those honorifics, another sensitive singer-songwriter of that era, at the very least, equaled his achievements. We are not here to bury Taylor. He deserves his success. 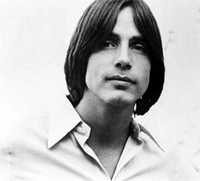 We are here to praise Jackson Browne. Although Sweet Baby James has out sold our hero better than 5 to 1, Browne is every bit the model singer-songwriter that James is, and if push came to shove, probably exceeds JT when it comes to perfecting the California sound prevalent in the 1970s. 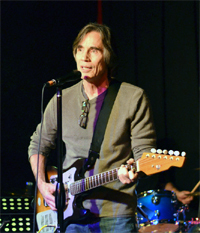 Proof can be found in Browne's impressive catalog of songs which includes: "Running on Empty," "These Days," "The Pretender," "Lawyers in Love," "Somebody's Baby," "Take it Easy," and "Doctor My Eyes." For more than 50 years, Browne has written and performed erudite, literate, and personal songs that effectively make sense of the human experience while passionately protesting its political shortcomings. Browne was inducted into the Rock and Roll Hall of Fame in 2004 (four years after Taylor). He also qualifies for the activist hall of fame. You'll find Browne performing at star-studded events to fight global calamities as well as concerts at high schools to help fund arts program. 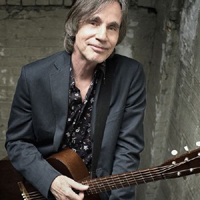 What sets Browne apart from other singer songwriters of his day is his ability to connect with people on an intimate level while still being able to shine light on the world's pressing issues. He also writes one heck of a good song. Despite being one of America's top songwriters, Browne was born in Germany. At the time of Jackson's birth, his father, an American serviceman, was stationed in Heidelberg, working for Stars and Stripes. Browne was born on Oct. 9, 1948. When he was three, he moved with his family to Los Angeles. He graduated from Sunny Hills High School in 1966. As a teen, he sang folk songs in local clubs including The Troubador Club. 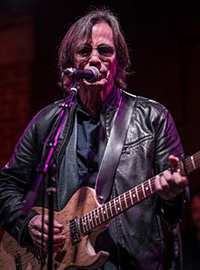 While his high school classmates were getting ready to be freshmen in college, Browne joined the Nitty Gritty Dirt Band. He only stayed with them for a couple of months, but the band recorded several of his songs including "These Days." After his stint with NGDB, Browne relocated to New York City and landed a job as a songwriter. Then he turned 18. While he was in the Big Apple, he played in bands that backed up Tim Buckley and Nico of Velvet Underground fame. In fact, Browne and Nico became a couple. Browne played a major role in the production of Nico's debut album, Chelsea Girl. He wrote songs and played guitar on several tracks. She, like so many others, recorded a version of "These Days." Their romantic relationship failed to make it to the end of 1968 as did his Gotham address. Browne moved back to Los Angeles and has been living in SoCal ever since. Browne released his first album in 1972. His self-titled debut contained the hit "Doctor My Eyes." To promote his release, he hit the road with Joni Mitchell and Linda Ronstadt. Also in 1972, the Eagles issued "Take It Easy," a song written by Browne and Glenn Frey. It was the Eagles' first single and it peaked at number twelve on the Billboard Hot 100. Browne's sophomore effort hit store shelves in 1973. Critics loved For Everyman, but it wasn't as successful as his opening opus. Sales returned for his third studio collection, Late for the Sky. One of the bestselling albums of 1974, the platter was anchored by "For a Dancer," "Fountain of Sorrow," and "Before the Deluge." The title track appeared in the movie Taxi Driver. Brown married actress Phyllis Major in 1975. She committed suicide in March of 1976. They had a son together; Ethan Zane was born in 1973. Browne was devastated by Major's suicide. Yet, he bounced back and released The Pretender (1978), one of the best albums of his career. The Pretender contains the tracks "Your Bright Baby Blues," "Here Come Those Tears Again," and "Linda Paloma." The title track was pretty good too. 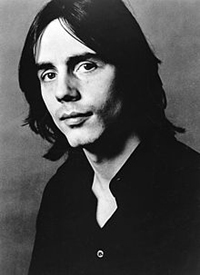 In 1977, Browne released Running on Empty which he recorded entirely while on tour. Despite being a live album, all the material was new. It was recorded on stage as well as in various makeshifts studios created while on the road. 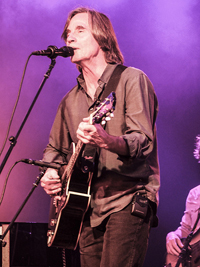 Besides the title track, Running on Empty contains a "Witchy Woman" type song, "The Load-Out/Stay." In 1978, Browne performed at two concerts held to protest nuclear power. He's been passionate about that cause ever since. The following year, Browne and several other musicians formed an anti-nuclear organization called Musicians United for Safe Energy (MUSE). Browne was also arrested for protesting a nuclear power plant in San Luis Obispo. The 1980s began with Browne scoring his first number one album, Hold Out. To this date, it's his only disc to reach the top of the charts. Browne married model Lynne Sweeney in 1981. They welcomed a son, Ryan, the follow year. In 1982, Browne supplied the song "Somebody's Baby" to the soundtrack of Fast Times at Ridgemont High. The song peaked at number seven and is the highest charting single of his career. Browne's next work, Lawyers in Love, came out in 1973 and gave the artist his fourth straight top ten LP. The video to the album's title track was one of the first to be played on MTV. Browne's 1986 album, Lives in the Balance, continued his focus on politics. The oeuvre produced nary a memorable single, but it did stay on the album charts for more than six months. Lives in the Balance was particularly critical of the United States' foreign policy in Central America and the presidency of Ronald Reagan. Poor sales followed his next offering, World in Motion (1989). It peaked at number 45 on the Billboard 200, but failed to capture platinum or gold status—a first for Browne. The eighties also saw Browne perform at several benefit concerts including Farm Aid and events produced by Amnesty International. Browne allowed four years to pass before releasing his next album, I'm Alive. It dropped in 1993 and was universally applauded. The following year, Browne cut a song with Kathy Mattea that appeared on Red Hot + Country, an AIDS benefit album. Browne's last new album of the 20th century was Looking East (1996). It fizzled despite contributions from David Crosby, Bonnie Raitt, Ry Cooder, and Vonda Shepard. Browne slowed his output in the 21st century releasing works about every six years. The Naked Ride Home dropped in 2002, Time the Conqueror in 2008, and Standing in the Breach in 2014. He also released two very successful live albums: Solo Acoustic, Vol. 1 (Live) in 2005 and Solo Acoustic, Vol. 2 (Live) in 2008. Volume One was nominated for a Grammy Award. We already mentioned Browne's induction into the Rock and Roll Hall of Fame in 2004. In 2007, he was inducted into the Songwriters Hall of Fame. Taylor beat him to that honor too. Browne dated actress Daryl Hannah from 1983 to 1992. Achievement in Fine Arts, and the NARM Harry Chapin Humanitarian Award. 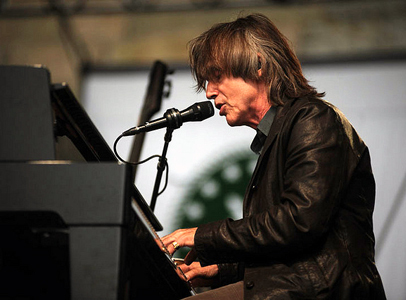 Occidental College gave Browne an honorary Doctorate of Music in 2004. Browne is a member of Ocean Elders, an advocacy group for oceans. Browne's song "Sky Blue and Black" appeared in the pilot episode of Friends. In 1985, Browne and Clarence Clemons released a duet entitled "You're a Friend of Mine." In 2003, Browne played himself in an episode of The Simpsons. Browne has publicly supported, and performed at rallies for, presidential candidates Ralph Nader, John Kerry, and John Edwards. 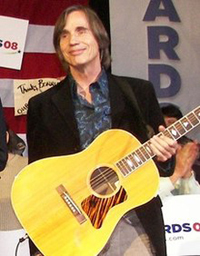 Browne sued John McCain and the Republican National Committee for using his song "Running on Empty" without permission. 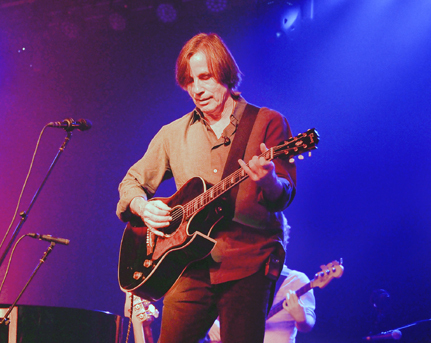 In 2010, Browne teamed with Ray Davies to record a cover of "Waterloo Sunset." Browne participated in a campaign to make it legal to stamp messages on U.S. currency. Jackson Browne and the late singer/songwriter Jimmie Spheeris where longtime friends in Los Angeles from an early age. Jackson sang backing vocals on a track for Jimmie’s 1976 Epic Records “Ports of the Heart” album (catalog #PE-34276). Learn more about Jimmie’s life and times at http://jimmiespheeris.com.